Signs Publishing, a publishing house based in Warburton Victoria, is a long-term customer of ours, and have been in business since 1885. Signs Publishing, print and distribute publications to customers around Australia including books, magazines and flyers. The team at Signs has purchased several pieces of Venus Packaging machinery in recent years to improve their packing and dispatch processes. For many years they had their printing, binding and finishing processes well and truly under control, but at the end of the production line, the processes were slowing down. Once finished, when products such as books and magazines were ready to be packed and shipped to customers, the staff would begin by by unfolding flat cartons and using a hand-held taping gun to seal the bottom of these boxes in readiness for printed matter coming off the production line. Once the products were packed the staff then used the hand-held taping gun again to seal the tops of cartons. Staff would race to fill the boxes and then tape them shut and carry them one-by-one to the pallet ready for shipping. Whilst the process worked, it caused a delay at the end of the production line and the team at Signs Publishing approached us at Venus for a faster and more operator-friendly process. In order to fasten and stream line the packing and dispatch process Signs Publishing looked for a faster solution to close and secure boxes and send them to the pallet for stacking. They decided upon the Venus Carton Sealer VH209 Mk III. This carton sealer is a heavy duty, mobile and fully adjustable box taper, meaning that differing widths and heights of cartons can be easily accommodated using this machine. The height of the machine can also be quickly and simply adjusted for operator comfort. The tape rolls that the VH209 Mk III uses can be up to 1000m in length, which means that frequent changing of the tape is not required. The roller ‘gliders’ remove the need for lifting boxes and allows a smooth process through the machine and out to where they can be quickly and simply placed on a pallet for dispatch. The production line was significantly sped up as a result of the use of the Venus Carton Sealer. The staff were, and still are, extremely happy with the introduction of this time saving, and ‘back-saving’ solution. The staff estimate that the time taken from packing boxes to sealing and preparing them for dispatch has been halved with the introduction of the carton sealer. 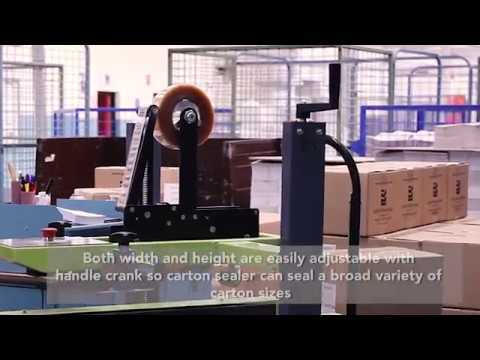 Watch our video of the team at Signs Publishing operating our Carton Sealer.